Imagine waking up in the morning and relaxing with a cup of coffee out on your own deck overlooking a beautiful lake... or walking down to the dock and taking out the pontoon boat for a sunrise boat ride! This beautiful cedar sided cottage has 4 bedrooms with 3 bathrooms (2 with tub/shower combinations, and 1 with a Jacuzzi tub), 2 gas fireplaces, a lower level recreation area with a large TV, wet bar, and game table; not to mention the amazing view from the front deck and fire ring overlooking the lake! There is a dock with a full-sized pontoon boat included, a gas grill for those family barbeques, as well as a grassy area for croquet and bean bag toss games! Stacy has been managing numerous beautiful lake properties since 2011, and Chickadee Cabin in particular for the past several years. She has enjoyed helping the owner share this wonderful cabin with other families. He says, "it has been in my family since 1996 when it was built. Now a widower, and living elsewhere, I am pleased to share this special place for other families to enjoy now." The owner indicates that his family loved sitting out on the deck, or by the fire in the fire ring, cooking S'mores and watching the sun go down over the lake! It was wonderful to be in the quiet bay, and able to catch Muskies right from the dock! We also enjoyed taking our pontoon boat out onto the (Placid) Lake, which is part of the Tiger Cat Flowage, giving us many acres on which to fish and explore! Chickadee Cabin is unique... being in a beautiful wilderness lakefront setting with amazing boating and fishing, yet in close proximity (only 4 miles away!) to amenities such as a bar/restaurant in case you don't feel like cooking one evening! Other on-site amenities include a pontoon boat, a gas grill, and a Jacuzzi tub! toilet, shower, jetted tub, Spa-like bathroom, with a Jacuzzi tub! Beautiful views of Placid Lake from nearly every window of the cabin! This cabin has its own private dock, nestled in a quiet bay... great for fishing! Go out onto the clear waters of Placid Lake on the included pontoon boat or fish right off the dock! XC ski out the front door right onto Placid Lake for miles of trails! There are 2 gas fireplaces, one on each level.... perfect for relaxing in front of on a cool summer morning or chilly winter's day! Relax by the gas fireplace in the Great Room overlooking the lake! A drip Coffee Maker is provided, to help you start your day right! There is room for 4 more people at the Kitchen Island... as well as lots of room outside at the tables on the deck overlooking the lake! Many fun board games are provided, in the lower level recreation/wet bar area. A variety of DVD's are provided for rainy day viewing; ranging from romantic comedies, to action adventures, to children's classics! Plenty of green space for games of croquet and bean bag toss; fun for all ages! There is a private dock and large pontoon boat included with the rental... a 2000 Sun Cruiser with a 40 HP Johnson motor and an electric trolling motor for hours of boating and fishing fun! Relax out on the deck with a cup of coffee or a glass of wine; beautiful sunsets as you overlook the lake.... There is also a retractable awning to keep you cool on those hot sunny days! There is a 9 hole golf course only 4 miles away from Chickadee Cabin! We had a wonderful stay at the Chickadee Cabin. It was very clean and comfortable. Would love to come back in the summer time and enjoy the lake. We are happy you were comfortable and enjoyed your visit to Chickadee Cabin. Summer is a wonderful season to visit the Northwoods. We look forward to your return! We enjoyed our stay. The cabin had a great set up for our families to come together, relax, and visit. The kids enjoyed the room with bunk beds, exploring the cabin, and playing games. The jacuzzi tub made it easy to convince each kiddo to break away for bath time in the big tub. We are so pleased the cabin worked out so perfectly for your families, Shauna. It's always good to hear that the kids were happy and enjoyed their time at the cabin as well. The home was warm, spacious and very comfortable. The kitchen was perfect for the Thanksgiving meal preparation. Everyone enjoyed the holiday 'just like home'. A special Thank You to Stacy, the property manager, for prompt attention to a minor request - on the holiday afternoon. We highly recommend this home and look forward to staying here again when we return to Hayward. Tom and Sharon, thank you for your kind words. :-) We are so pleased you all had such a wonderful Thanksgiving holiday and felt so at home! We will be happy to welcome you back any time. We had a GREAT time and truly enjoyed ourselves!!! The home was warm, welcoming and extremely comfortable. More than enough room for a group to be comfortable. We are already planning on returning next year. Even though it snowed 1/2" one day, we still spent time on the boat enjoying the colors, loons and bald eagles. Fishing was slow but that was to be expected. The only recommendation I have is on the lack of "small conveniences" in the kitchen. In other houses I've rented, we have always found available seasonings beyond salt and pepper such as garlic powder, onion powder, seasoned salt, etc. and other items such as aluminum foil, plastic/Saran wrap, etc. These small "extras" create an even more "homey" feel and add a huge convenience that we don't need to bring with us. I realize everyone has different needs/tastes but a few of the regulars would satisfy most needs. We now know next year we will need to bring these extra items....but that will not stop us from returning!! Beautiful Home!! Very nice lake. It is rated Class A Musky, but we were landing nice walleye.2-8 pounders. Conversed with Stacy via text. Very polite and in contact to answer an questions, but she lets you do your thing. Pontoon boat is in really good shape, ideal for fishing with a group. Myself, Son, Brother, and Friend has a Great time. I highly recommend. We will be definitely returning!! Thank you for your kind words, Philip. :-) We are so happy you were able to catch such nice walleye from the pontoon! We're very pleased you plan on returning....we look forward to seeing you again! I would highly recommend a stay at the Chickadee Cabin. The view of Lake Placid is spectacular, the interior is clean and well laid out. Our family visited a week in early October, the fire pit and two fire places were great perks at that time of the year. Thanks and we look forward to a future visit. Carol Ann, we are so pleased you so enjoyed Chickadee Cabin. It is, truly, a lovely view of Lake Placid from the cabin. The fireplaces and fire pit do help make those cool days and nights cozy and comfortable. We are so happy you will be visiting us again! 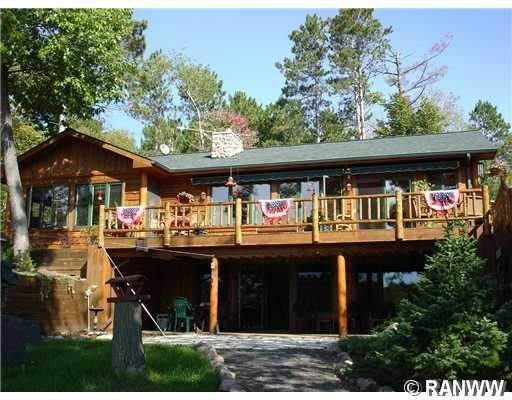 Chickadee Cabin is located on the shores of crystal clear Placid Lake, just 11 miles from Hayward, WI. Placid Lake is the southern most part of the Tiger Cat Flowage chain of six lakes for a total of 1700 acres of fantastic fishing and recreational boating. As a Class A Musky Lake, the lake chain is full of muskies, large mouth bass, and walleye! The cabin is nestled among beautiful pines and oaks, providing a sense of wilderness... imagine sitting by the campfire overlooking the lake as the sun is setting... yet there is the convenience of a bar/restaurant at Lakeview Golf and Pizza, only 4 miles away! So besides fishing and boating, if your family or group is interested in golfing, there is that family-friendly 9 hole, par 3 golf course just 4 miles away! Many other attractions and activities are available just a short drive away in Hayward; such as great shops, a movie theatre, restaurants, live music, festivals, lumberjack shows, the Wilderness Walk (with animals), the National Fishing Hall of Fame, the Birkiebiner Ski/Hiking trail, mini golf, Hookstone Winery, etc. !